Naphthalene Poisoning is the accidental or intentional intake of the substance or products containing naphthalene. What are the Causes of Naphthalene Poisoning? What are the Signs and Symptoms of Naphthalene Poisoning? The signs and symptoms of Naphthalene Poisoning can vary from one individual to another. It may be mild in some and severe in others. Several systems of the body may be affected. Individuals with the genetic condition glucose-6-phosphate deficiency disorder and certain other disorders affecting the kidney, liver, or blood, are at a higher risk for severe symptoms and complications. How is First Aid administered for Naphthalene Poisoning? Who should administer First Aid for Naphthalene Poisoning? 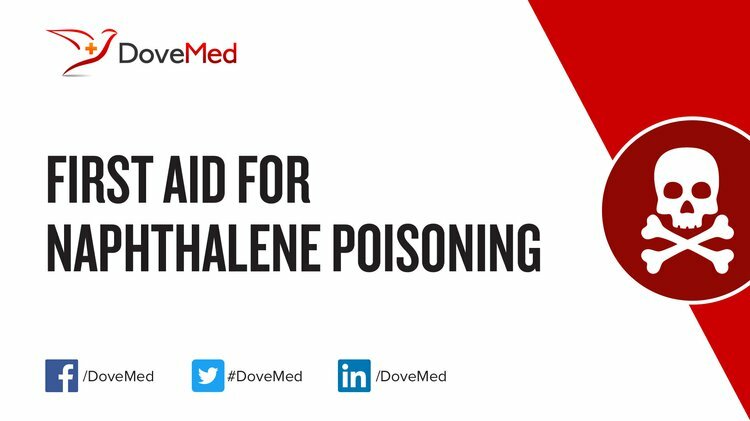 First aid for Naphthalene Poisoning is administered by healthcare professionals. What is the Prognosis of Naphthalene Poisoning? How can Naphthalene Poisoning be Prevented? Rahman, M. M., Mowla, S. G. M., Rahim, A., Chowdhury, F. R., Jahan, S., & Hasan, M. N. (2012). Severe haemolytic anaemia due to ingestion of Naphthalene (Mothball) containing coconut oil. J Coll Physicians Surg Pak, 22(11), 740-741. Annamalai, K. C., Shrikiran, A., Mundkur, S. C., & Varma, P. C. (2012). Acute naphthalene toxicity presenting with metabolic acidosis: A rare complication. Journal of Acute Disease, 1(1), 75-76. Kundra, T. S., Bhutatani, V., Gupta, R., & Kaur, P. (2015). Naphthalene Poisoning following Ingestion of Mothballs: A Case Report. Journal of clinical and diagnostic research: JCDR, 9(8), UD01-2. Vijayavel, K., Anbuselvam, C., & Ashokkumar, B. (2013). Protective effect of Coleus aromaticus Benth (Lamiaceae) against naphthalene-induced hepatotoxicity. Biomedical and Environmental Sciences, 26(4), 295-302. Deo, P., Sahu, K. K., Dhibar, D. P., & Varma, S. C. (2016). Naphthalene ball poisoning: a rare cause of acquired methaemoglobinaemia. BMJ case reports, 2016, bcr2016215102. Chauhan, V., Sharma, R., Sharma, K., Sharma, G., Jitender, S., & Jearth, V. (2014). Naphthalene poisoning manifesting as hemoglobinuria. Toxicology international, 21(3), 314. Kapoor, R., Suresh, P., Barki, S., Mishra, M., & Garg, M. K. (2014). Acute intravascular hemolysis and methemoglobinemia following naphthalene ball poisoning. Indian Journal of Hematology & Blood Transfusion, 30(Suppl 1), 317. Sudakin, D. L., Stone, D. L., & Power, L. (2011). Naphthalene mothballs: emerging and recurring issues and their relevance to environmental health. Current topics in toxicology, 7, 13.